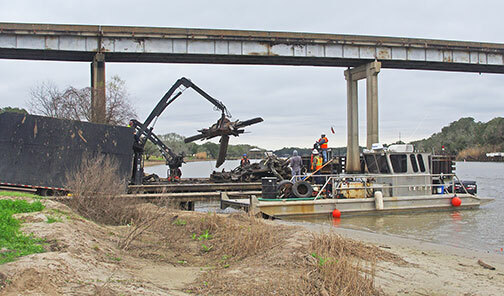 A trash barge piled high with river debris from the lower region of the San Bernard River, jockeys into position at the Churchill Bridge to begin unloading on Wed Feb 7th. 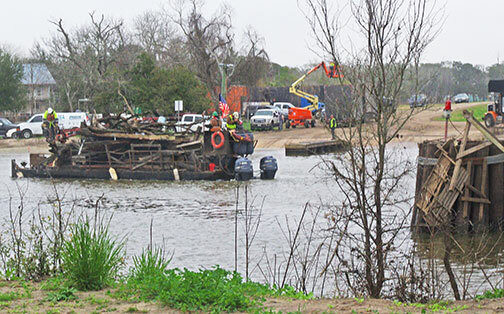 Texas General Land Office crews unload a trash barge into a waiting trash truck. Read Tara Whittle, GLO speaker at the "State of the River" meeting, discuss GLO plans for river debris removal.